Handmade, hand-polished, finest quality boxwood modeling tools. Natural finish. Average tool length is 8 inches. Use them to work with wax, pugged clay and oil-based modeling clay. These durable, polished tools are made from fine exotic hardwoods. Primarily used for working with sculpture, the smaller ones range from 7.5" to 8" long, and the larger ones from 9" to 11" long. 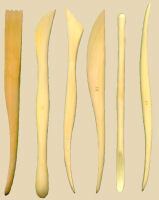 Each size has a sharp pointed angle on one end for cutting, slicing, scraping, and trimming the bottom of pots while on the wheel. The other end has a smooth concave edge to create a consistent foot on your pots. Made of the finest Beechwood and handcrafted by well-trained artisans to ensure the highest quality at an affordable price. Each Foot Shaper is 8" long. Bill Van Guilder, a master potter and host of DIY network's "Throwing Clay" series has been designing and refining pottery toools for the last 30 years. This Undercut tool measures 1" x 5" and has beveled edges to create a slight angle at the base of your pots.